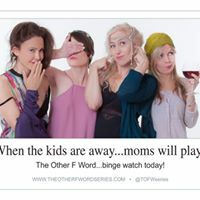 (Press Release) Boston: The Other F Word is the break out episodic comedy about four friends who find that the angst of raising kids may be nothing compared to the angst of starting over after they are grown. Season Two of the hit indie comedy series The Other F Word recently launched on Amazon and will have a special event screening in Waltham to celebrate women coming together to help women and what show creator Caytha Jentis calls “the power of Mom.” The show will be screened at the Embassy Theater in Waltham, MA on November 9, 2017 at 7pm. There will be a Q & A after with cast and crew. Despite Hollywood’s obsession to portray “young faces” on television, The Other F Word Series has proven after only one hit season that there is a high demand for programming geared toward women over 40. The Other F Word Series was one of the top series on Amazon Video Direct for four months running and has been streamed daily since its release September 3, 2016 and has a large audience of devoted viewers. While The F originally stood for fifty and forty, it more importantly stands for for friendship, family, feminism and fun. The second season cast lineup is something to look forward to – including: Judy Gold, Steve Guttenberg, Gilbert Gottfried, Michael Boatman, Alysia Reiner and Nancy Giles. Plus, former Comedy Central EVP and comedian Judy Gold joins Jentis as an Executive Producer. A fantastic line up that is sure to make the second season another huge success. Special Event Screenings are being organized throughout the country by major influencers and women entrepreneurs such as Peach, iRelaunch and Lady Savant. #WomenSupportingWomen. The screening of Season Two of The Other F Word is to create a fun and empowering night out as well as giving people in the community to promote the spirit of entrepreneurship. "The success of our show is rooted in our grass roots marketing campaign and have met so many amazing women on the road - of all ages. Bloggers and influencers have helped spread the word of our show through word of mouth and social media and that's very much a part of my message on the screen and behind the scenes.' Caytha Jentis Executive Producer of The Other F Word "I very much believe that its important for support women run businesses and to create community. We shine brighter when we work together. And believe it's important to work hard and play hard - our tag line is "fun never gets old."